Yahoo reported a 5 per cent drop in revenue for the third quarter, with the money it makes from display and search ads both continuing to decline. Revenue for the period ended Sept. 30 was $US1.2 billion, down 5 per cent from a year earlier, Yahoo said Tuesday. Excluding traffic acquisition costs, revenue was down 1 percent. Its profit for the quarter was $US297 million, much lower than last year, when it made a big one-off gain from selling shares in China's Alibaba Group. On an operations basis, Yahoo's profit for the quarter was $US93 million, a drop of 39 per cent. 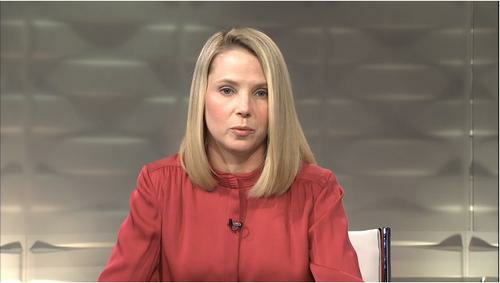 "I'm very pleased with our execution, especially as we've continued to invest in and strengthen our core business," CEO Marissa Mayer said in a statement. Mayer took over the company last July and is trying to restore Yahoo to its glory days, by making products like Yahoo Mail cool again. She's also made a string of acquisitions, including Tumblr for $US1.1 billion. The number of people using Yahoo's services has grown - on Tuesday it said it has 800 million monthly users, up 20 per cent in 15 months - but it hasn't turned those users into top-line growth. Yahoo sold slightly more display ads last quarter than it did a year earlier, but the price per ad (excluding Korea) fell, bringing display revenue down by 7 per cent, to $US470 million, the company said. It also sold more clicks on ads -- they were up 21 per cent from last year -- but the price per click (excluding Korea) also declined, by 4 per cent. Search revenue overall fell 8 per cent in the quarter, to $US435 million.